There is nothing quite like an action packed January for beating the January blues. 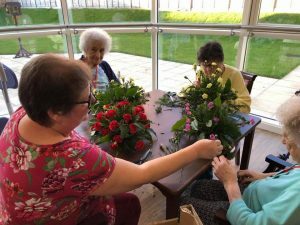 With the Christmas decorations packed away for another year, our budding florists created some beautiful arrangements to brighten up our lounges. 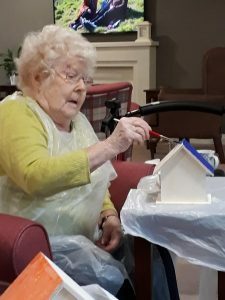 A lovely group activity and a time for a natter and exchange of creative ideas. We have also used the decoupage technique, to make beautiful gift boxes, in one of our crafting sessions. Our activities coordinator, Joy, arranged for some fabulous entertainers to visit our home. The Pianoman was a huge hit as always and a good sing-along in the lounge lifted spirits. 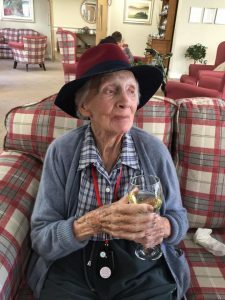 Some of our residents had family and friends join for a delicious roast lunch with fizz. January can so often be a perfect time to catch up, after the crazy festivities of Christmas are over. We also had a very lively afternoon of entertainment with The Worcester Ukelele Band. Our favourite song was, of course, Somewhere over the Rainbow – which always sounds so much more upbeat on the ukelele. 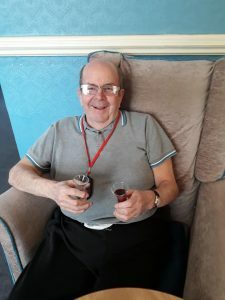 Ron enjoyed a sherry tipple of two, toe tapping along to the music. You can see from this picture how much he enjoyed the afternoon. We have a new group of tiny tots visiting us now every two weeks from Magic Moments Nursery School. 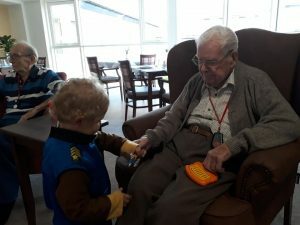 It is wonderful to see the friendships between the young and older generations developing. 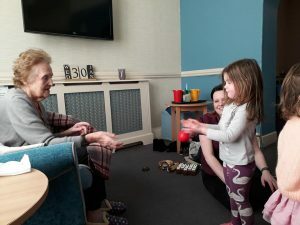 They bring such fun and laughter; singing songs together, playing musical instruments, throw and catch and listening to stories. Hide and seek under our residents chairs was very amusing and the children running under the parachute in our exercise session, squealing in delight. We are looking forward to their next visit. An introduction to Paw Patrol! 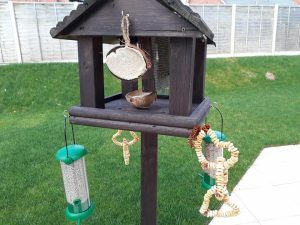 The Big RSPB Garden Bird Watch was this January and we hand painted bird boxes for our new garden areas and made bird feeders. Our maintenance man also built our new poly greenhouse and we have dates in the diary for February to resume Gardening Club after the winter break. 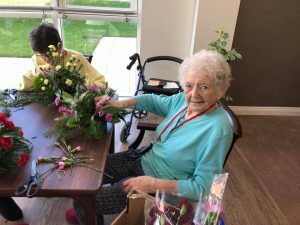 Our residents will be deciding what flowers and vegetables to plant. We are short of large pots, seed trays and hand tools. If you are having a Spring clean please do bear us in mind. We would appreciate any donations. Please give us a call for our full list of activities or pop into reception. You would be welcome to join us for a cuppa or to take part in activities. Or maybe challenge our residents to dominoes or a board game! We have a regular coffee morning every Friday between 11 and noon. The coffee mornings in January were hugely successful.